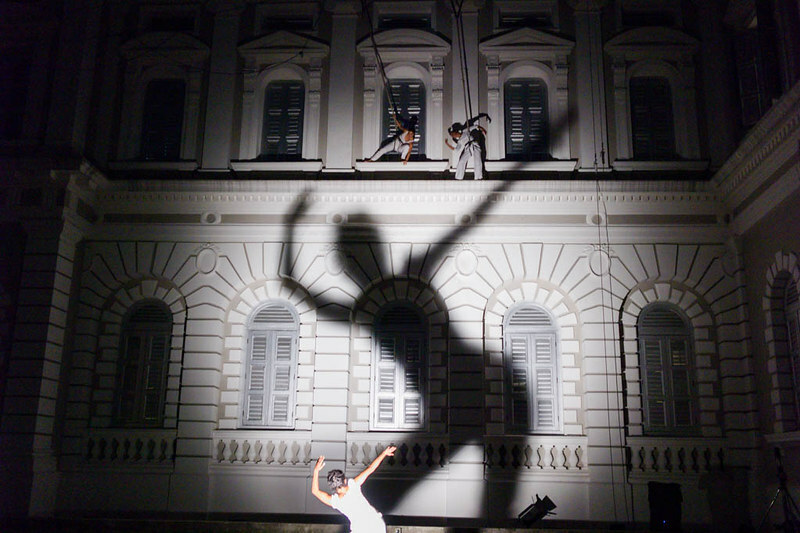 The annual nocturnal extravaganza, the Night Festival is once again upon us for the sixth time, with the event being renamed the Singapore Night Festival for this year’s showcase, and promises an enthralling line-up of local and international art performances and cultural programmes in the heart of the city, stretching from Plaza Singapura all the way to Raffles city over the two weekends of 23 and 24th August, and 30th and 31st August 2013 (7pm to 2am, Fridays and Saturday nights). This year’s festival brings together 35 partners from the Bras Basah.Bugis community to showcase the buzz, energy and vibrancy of Singapore’s arts and heritage precinct. This is more than twice the number in 2012, and offers festival-goers with more options for entertainment, dining and even late night shopping as they enjoy the varied offerings within the festival grounds. I was invited for the media preview of this annual nocturnal event, and we were brought on a whirlwind tour of the highlights of the festival. Starting from within the grounds of the National Museum of Singapore (NMS), which is where the media preview started off, (the NMS is the organiser of the Night Festival) we were first taken to ABSOLUT CANVAS, one of the main highlights of this year’s Night Festival. 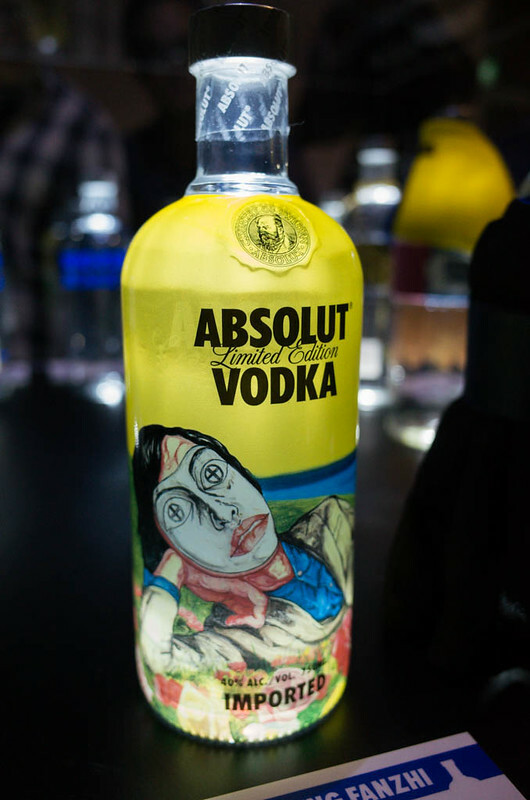 This is my favorite limited edition design of the ABSOLUT VODKA bottle. 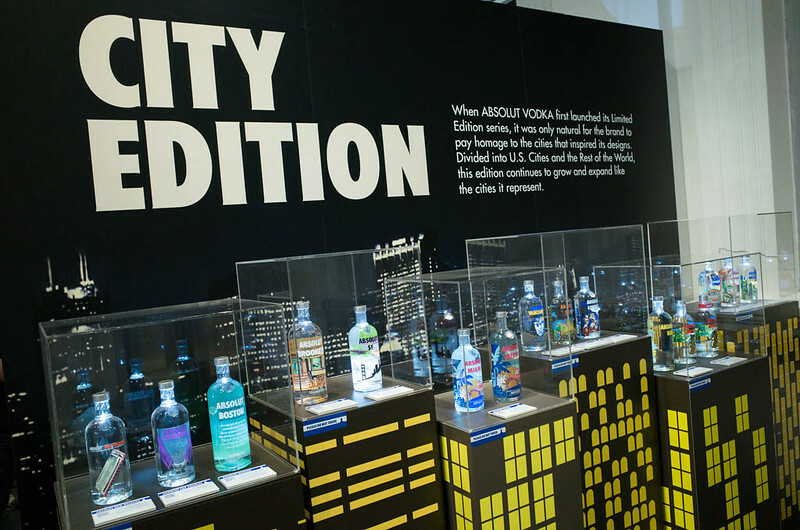 The iconic ABSOLUT silhouette steps into the limelight with an exhibition that showcases the ways in which the company cultivates creativity and innovation. 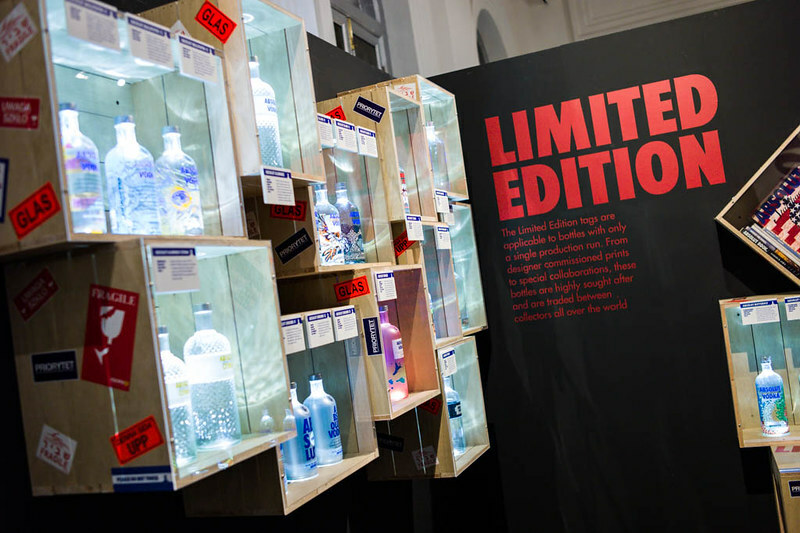 From 23rd August to 2nd September, visitors will be able to take a gander at the close to a hundred bottles of ABSOLUT VODKA, and feast their senses on the intricate and varied designs of the rare and limited edition bottles separated into six different theme showcases. 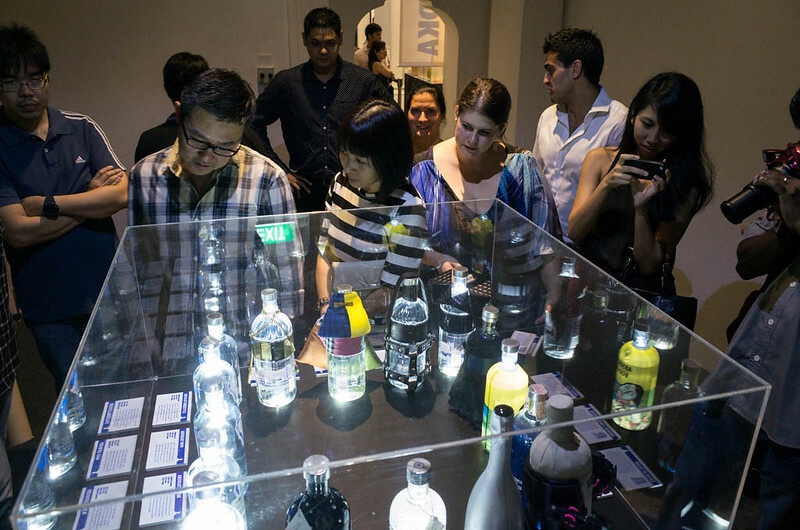 Visitors were enthralled by the limited edition ABSOLUT VODKA bottles on display. 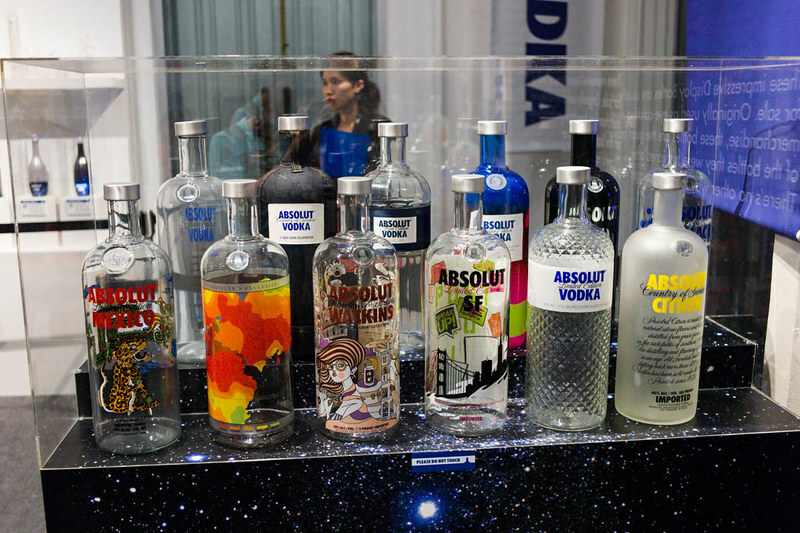 Designer ABSOLUT VODKA bottles on display at ABSOLUT CANVAS, one of the highlights of the Singapore Night Festival 2013. The beautiful designs are a testament to ABSOLUT’s committment to cultivating creativity, allowing artists and designers to use their bottles as canvas for creating art. 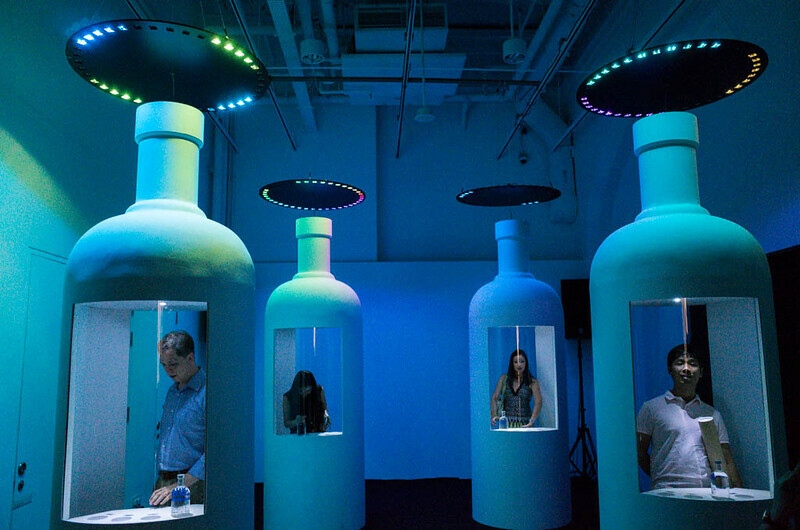 I also love the CANVAS SYMPHONY area within the exhibition, which is a space for visitors to express their creativity by interacting with ABSOLUT bottles, creating different musical sounds and notes based on bottles they picked up and put down! Members of the media and invited guests trying out Canvas Symphony at the Singapore Night Festival 2013. 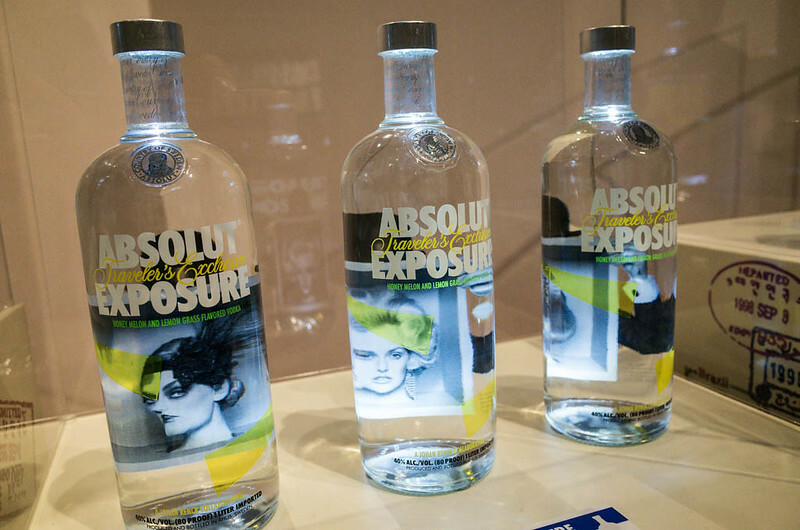 Limited edition ABSOLUT VODKA bottles. 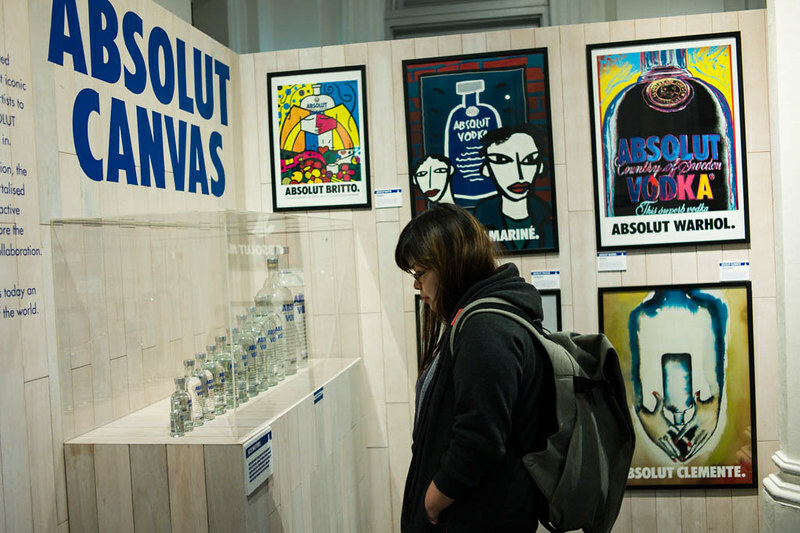 Admiring the display at ABSOLUT CANVAS. 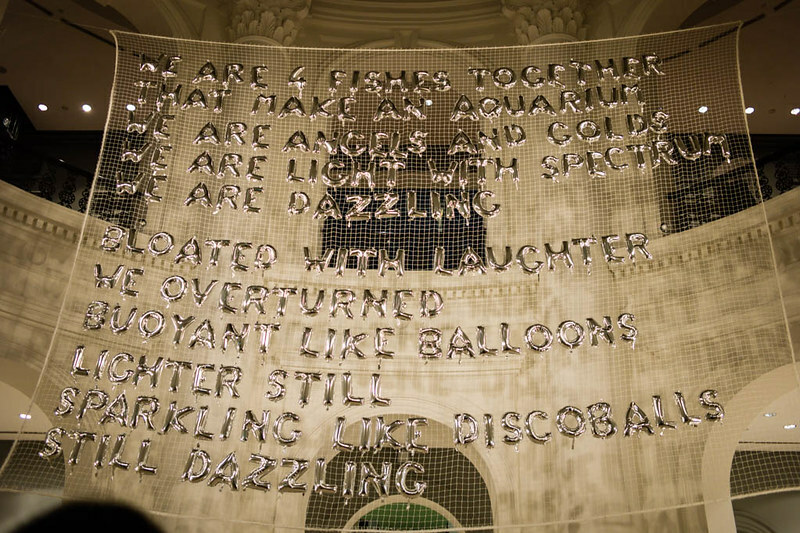 After that we were shown Singapore and France-based artist SoonKoon Ang’s Everlast, an installation created with foil balloons, a visual poem which the arrangement of text and the selected material for the visualisation are important in conveying the intended effect of the work. 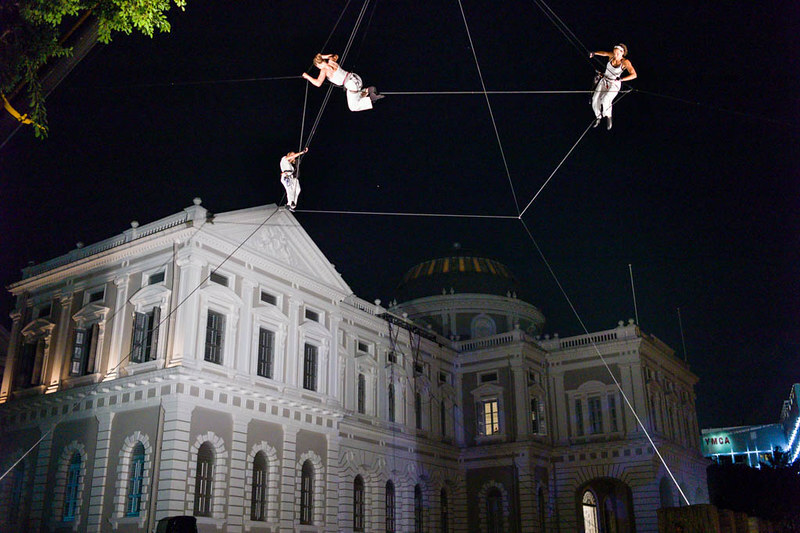 Next, we were ushered to the external facade of the National History Museum, where our senses were treated to Vertical Extraction by Compagnie Retouramont, with dancers embarking on a vertical journey up the facade of the National Museum and breaking into rhythmic dances on bungee cords. Light projections amplified the dancers’ bodies, and a special video by acclaimed local artist and filmmaker Victric Thng complemented Vertical Extraction to offer new perspectives on movement and the environment. 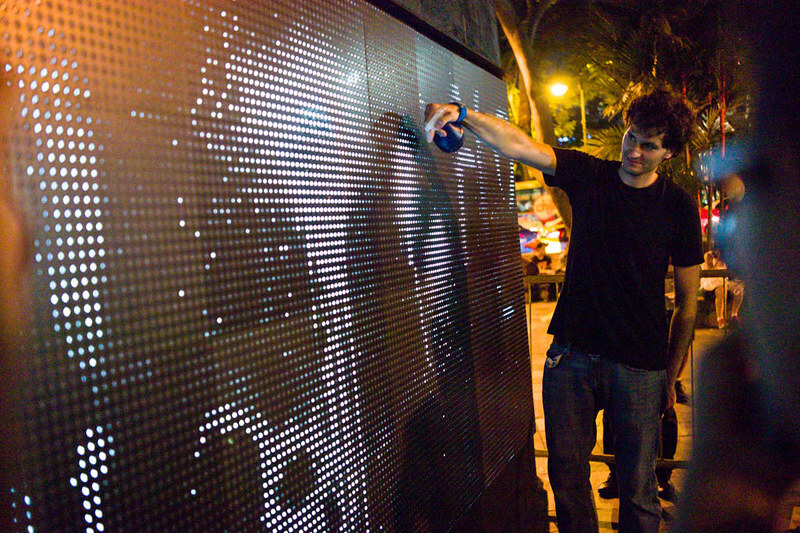 We headed over to Raffles City for our next stop, where Antonin Fourneau showed us his delightful creation based on the simple idea of illumination – an electronic graffiti wall called Water Light Graffiti, which enables one to draw or write ephemeral messages which appears as light against a wall of LEDS, which are activated by water. On rainy days this LED board would turn into a spectacular fireworks display! 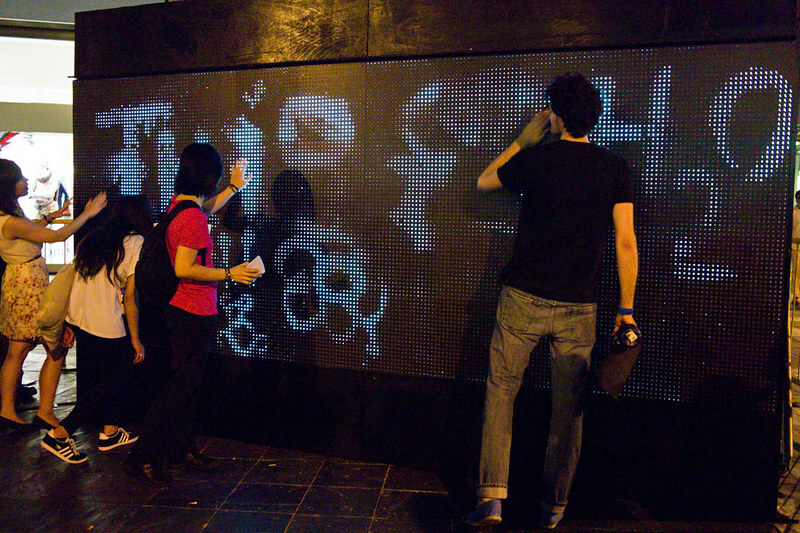 The artist showed how simple it is to create ephemeral and transient graffiti using just water on the special LED board. Members of the media got to try out the water based LED graffiti board. 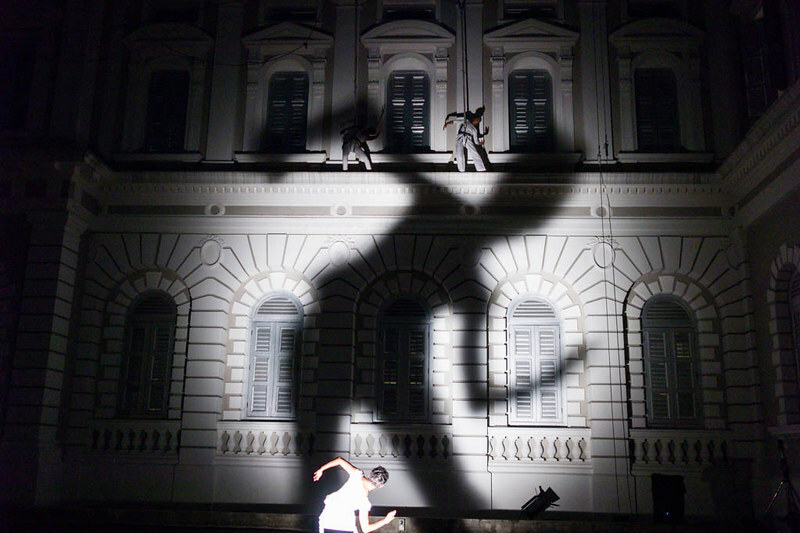 The next act was ooMoonbeings by Singapierot along Armenian street. It tells the story of two ethereal jesters descending from a crescent moon and exploring the land. Dressed in plastics, these contemporary incarnations of Pierrot play in a series of teasing vignettes combining movement and installation. With a whimsical old-time mood, this little reverie features gypsy-swing jazz duo So Ma Fan as live accompaniment. 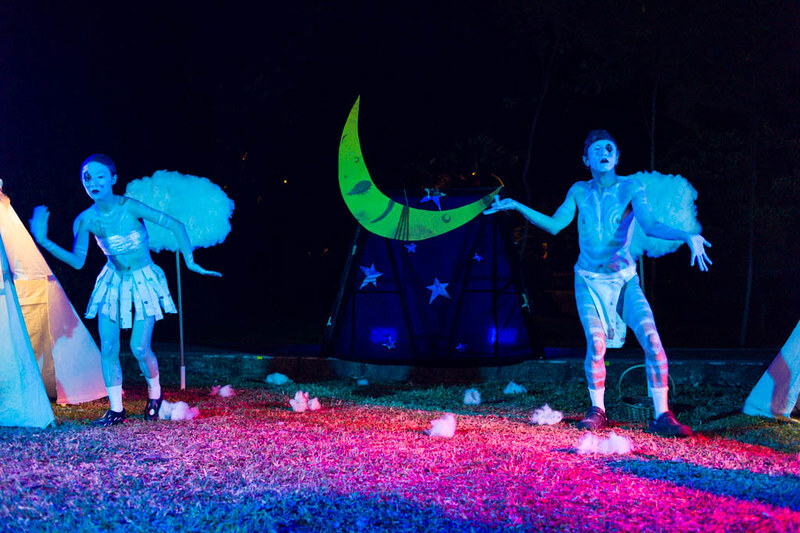 Two ethereal jesters exploring the world they landed on from the moon in ooMoonbeings. Ethereal court jesters exploring the land. Two ethereal jesters from the moon. 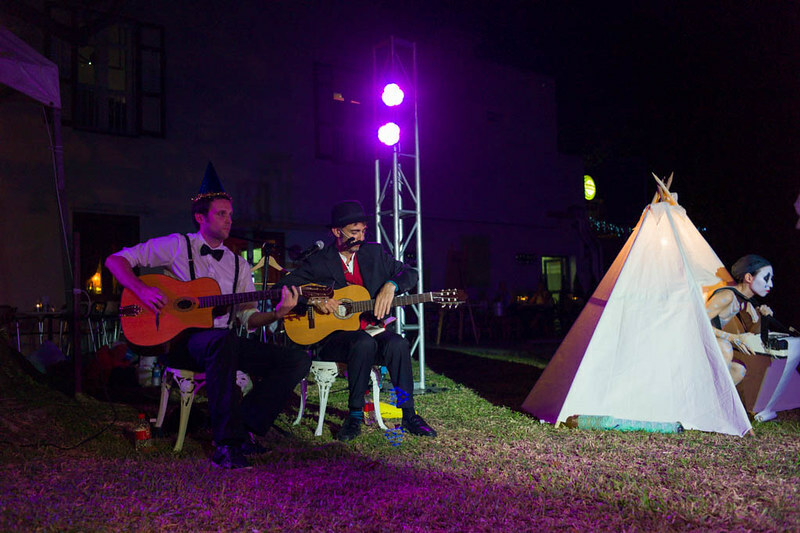 So Ma Fan (“so troublesome in Chinese), the gypsy-swing jazz duo provided the live music accompaniment for ooMoonbeings. Pyramid of Void by Compagnie Retouramont wowed the attendees of the media preview next with gravity defying acts high above the ground – dancers demonstrate their acrobatic creativity and agility as they negotiate the minimalist set made up of ropes formed into the shape of a pyramid structure suspended in mid-air, outlining the contours of a void, an abstract space invisible to the eye, with the ropes as their only form of support. Their movements form a dialogue with the pyramid, breathing life into the structure and giving shape to the spaces in-between. Pyramid of Void at the Singapore Night Festival 2013. 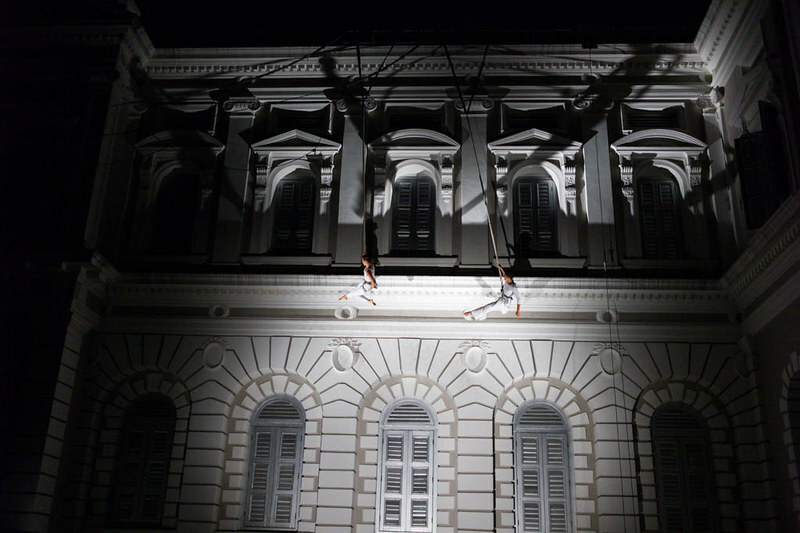 Starlight Alchemy; Redux @ Singapore Night Festival is up next, set against the facade once more of the National Museum of Singapore. it brings together a collection of performance pieces staged at various times throughout its existence (hence the “Redux” part in the name!). 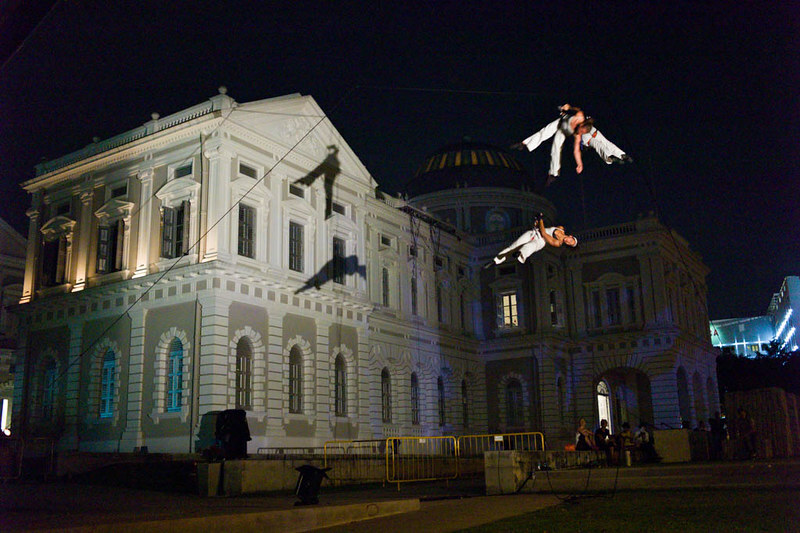 Starlight Alchemy at the Singapore Arts Festival 2013. 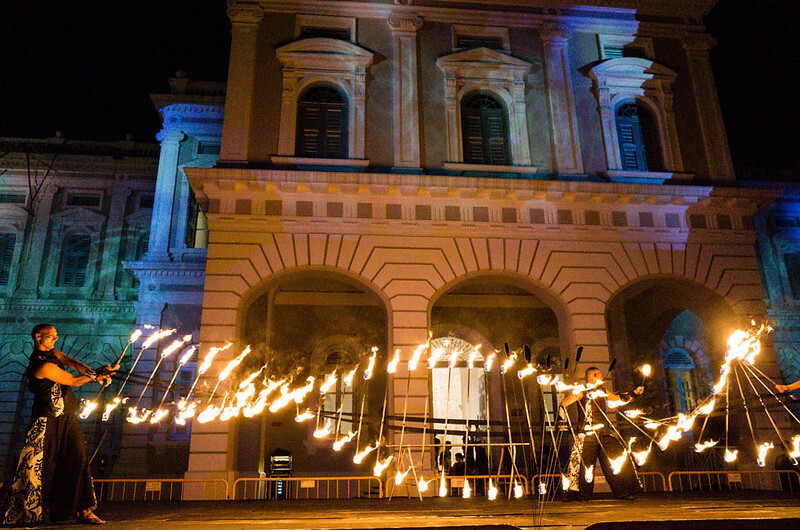 Using various fire and LED tools specially created by Starlight Alchemy, this unique and eclectic group of fire and LED artists performed amazing feats which wowed the media, complemented by LED projection on the facade of the National Museum of Singapore. 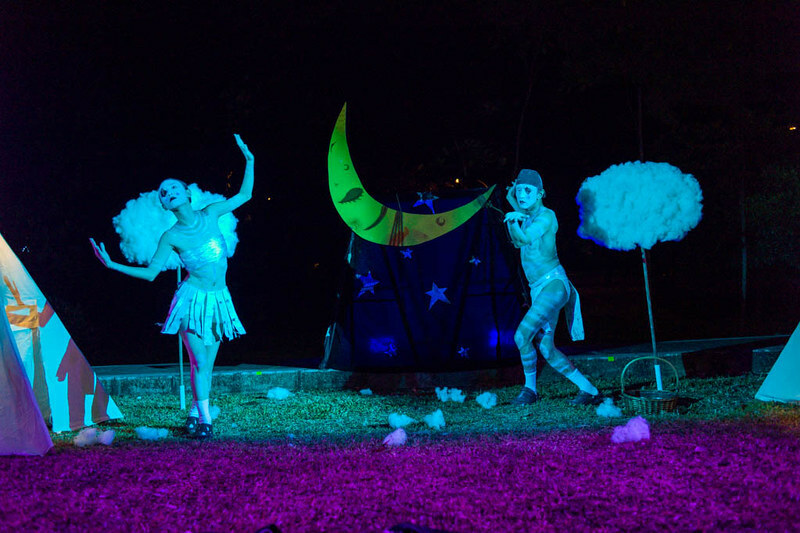 We were told that the final performance of each night will also include a free play and jam session where visitors to the Singapore Night Festival can try their hand at playing with the LED manipulation tools used by the artists. 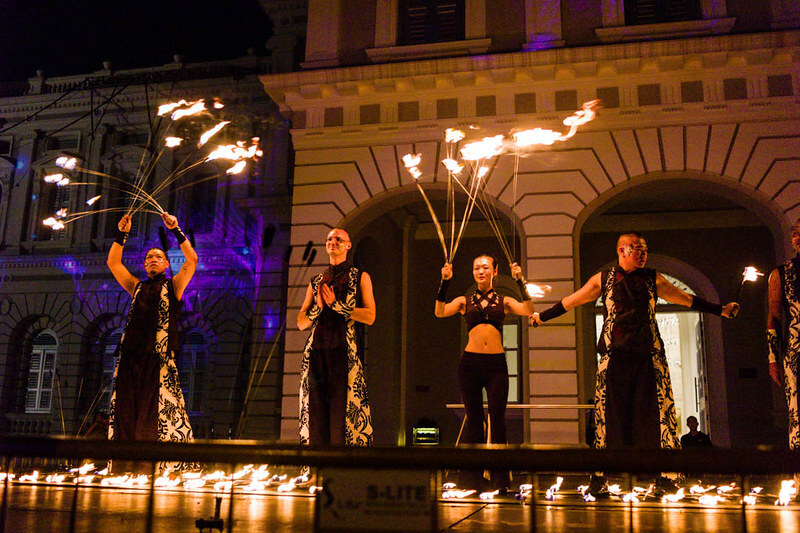 A display of pyrotechnics, fire and LED projection by Starlight Alchemy! 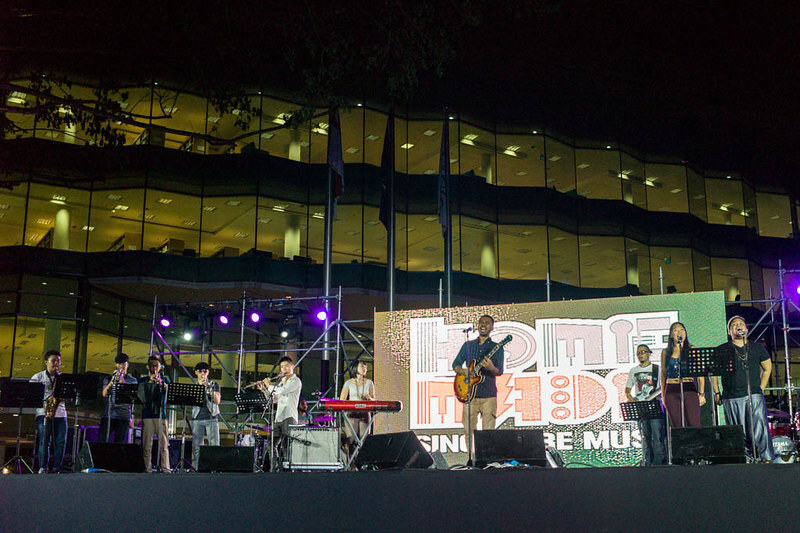 The last item of the media preview night was Homemade, at the Singapore Management University Green. 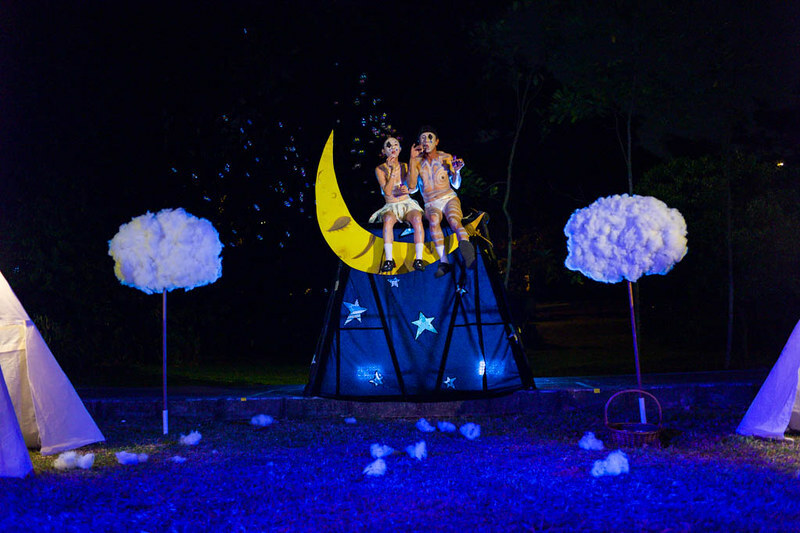 This electric symphony project was conceptualised specially for the Singapore Night Festival 2013 and brought to fruition by Ewan A.S. and Syed Ahmad. This 20 strong orchestra features a strings section, two drummers, a turntablist, a horns section, two guitarist and a bassist, and aims to be Singapore’s first “rock” orchestra. Homemade at the Singapore Night Festival 2013. All in all it was a fun night topped off with free alcohol at the ABSOLUT VODKA booth. The Singapore Night Festival 2013 premiers TONIGHT, the 23rd August and runs over the two weekends of 23 and 24th August, and 30th and 31st August 2013 (7pm to 2am, Fridays and Saturday nights). For more images from the media preview, please visit my Flickr set on the media preview of the SIngapore Night Festival.